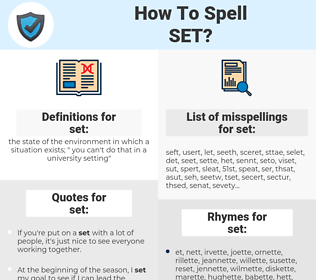 What are the misspellings for set? What are the common mistypes for set? 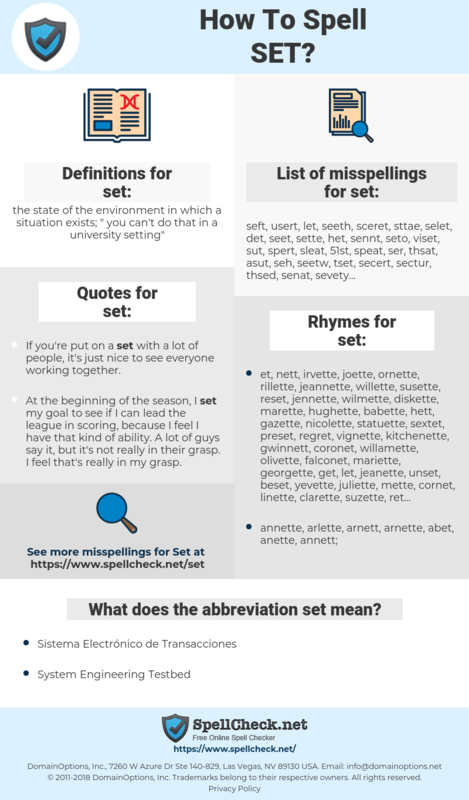 What is the definition of set? What does the abbreviation set mean? What are the usage examples for set? What are the quotes for set? What are the rhymes for set? What are the translations for set? What are the common typos for set? the state of the environment in which a situation exists; "you can't do that in a university setting"
This graph shows how "set" have occurred between 1800 and 2008 in a corpus of English books. There are allowable limits for radiation going- I mean there's radiation all around us. There's radiation from your television set. There's radiation from your computer. There's radiation actually occurring in the ground. My mother was very agnostic. She would never set foot in the synagogue, she couldn't be doing with it. monter, configurer, mettre, définir, régler, déterminer, se coucher, établi, prédéfini, décor, fixes, assigner, remettre, jeu, placer, situer, poser, arranger, composer, kit, programmer, enchâsser, fixée, fixées, défini, programmée, aire. stellen, bestimmen, Gruppe, angeben, festlegen, binden, legen, festsetzen, aufstellen, einrichten, Reihe, ansetzen, aufgeben, einstellen, Menge, Serie, setzen, fixieren, fest werden, untergehen, gesetzt, festgelegt, Set, Satz, Garnitur, Service, bestimmt, versetzen, Zusammenstellung, veranlassen, fest, fassen, aushärten, abbinden, schränken, justieren, gelieren, erstarren, einrenken, gestellt, aufgestellt, gelegt, festgesetzt, fixiert, ausgehärtet, untergegangen, erstarrt, fest geworden, Bühnenbild, Kulisse, Aggregat, Szenenaufbau, Clique, Bühnenausstattung, Fixer, Ensemble, Donner, Plateau, Assortiment. セット, 集合, 揃い, そろい, 極める, ひと, ひとそろえ, しゅうごう, 嵌め込む, 一揃い, 舞台背景, もっす, はめ込む, 没す, とはい, 鏤める, 没する, ちりばめる, 散りばめる, 徒輩, 歿する, 御決り, ぼっする, きめる, ぶたいはいけい, 一揃え, 散り嵌める, ひとそろい. passar, feito, aparelho, linha, posto, jogo, compor, arrumar, fixar, constantes, impostos, fixado, impostas, estabelecidos, fato, regulado, enunciados, configurada, instituído, traçados, estipulados. fijar, tipo, establecer, ajustar, poner, ponerse, conjunto, juego, decorado, gama, dar, encajar, colocar, marcar, escenario, aparato, criar, montar, armar, determinar, ajustado, equipo, clase, imponer, reducir, determinado, criado, colocado, preparar, baraja, manga, dado, sentar, definido, decidir, configurar, depositar, endurecer, previsto, fraguar, montado, seleccionar, componer, componerse, cuajar, endurecerse, engastar, estipulado, programado.